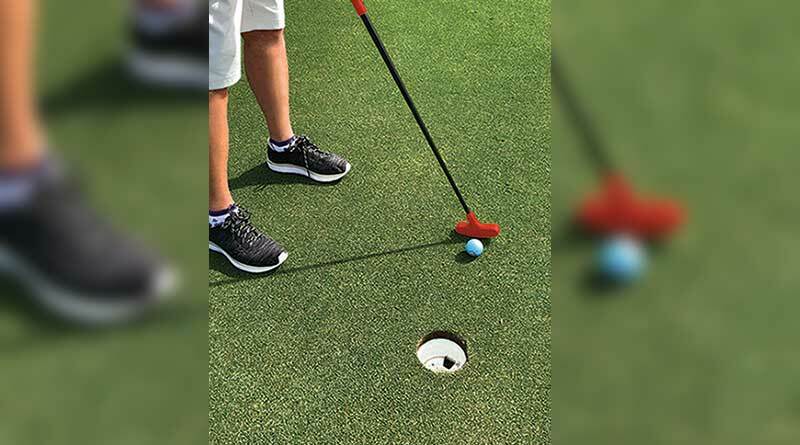 After three years of R&D, Adventure Golf Services (AGS) is introducing the “AGS Soft Putter™,” a standard miniature golf putter with an improved putter head designed to minimize damage caused by rough play or vandalism. An independent test recently initiated and conducted by a client, where they randomly struck an object 200 times with both new and traditional putter designs, concluded the new AGS Soft Putter™ design was the best way to protect their investment on the theming throughout the course. According to AGS, previous solutions to minimize damage have ranged from improved glue or mortar in edging, installing large decorative concrete shapes which withstand more beating, to pouring concrete edges in place of brick or other edges. Most of these solutions resulted in increased installation costs. Earlier rubber putter head solutions from other manufacturers seemed to wear out too rapidly and were not widely adopted. Says Mike Arnold, VP Custom Modular & Cruise Ship Division of Adventure Golf Services, “We tested many ideas including breakable putters, spring mounted putter heads, a type of universal joint mounted in the shaft with tension screws, and all proved to be insufficient. “The AGS Soft Putter™ is one of many innovations to expand our product line and better serve the industry,” says Scott Lundmark, President of Adventure Golf Services. “Other new concepts we have introduced include stainless steel custom hole cups, which last longer and improve carpet installation around the hole cup. “We invite any owner or operator of a facility, which has a miniature golf course, to test the putter by visiting our web site at www.AdventureAndFun.com and fill out the ‘Request an AGS Soft Putter™ Test Putter’ form, and we will ship one to you at no cost or obligation to companies in the United States.” International clients can also request the putter but will need to pay shipping. AGS is a global leader in the design, fabrication, and installation of fun, interactive, cost-effective entertainment attractions like miniature golf, pickleball, shuffleboard, bocce ball, croquet & other recreational courts. Besides concrete-poured installations, AGS has long term experience installing interlocking panel system versions on rooftops, cruise ships, indoor waterparks, and other outdoor applications, such as amusement parks, family entertainment centers, hotels and resorts, and other attractions.